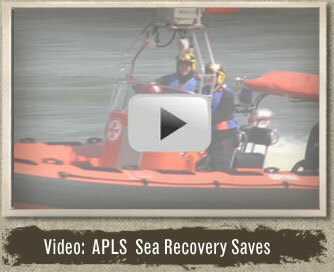 APLS Sea Recovery is a rugged body bag designed to safely remove deceased individuals from rivers, lakes and seas. Tested by the Los Angeles County Sheriff's Department to a depth of 165 feet, APLS Sea Recovery is designed to withstand the toughest water conditions while improving the efficiency of a recovery operation. APLS Sea Recovery is constructed with a vinyl coated mesh polyester material and can support between 350 and 450 pounds. The net-like material allows water to pass through the bag during ascent and then quickly drain as the bag reaches the surface. A skid segment on the bottom of each APLS Sea Recovery bag reduces friction, therefore lessening the amount of effort needed to pull the loaded bag over the side of a recovery vessel. The skid segment also protects the side of the boat from any damage. Vacuum packed bag is 16.5" x 18.5" x 4.5"